On behalf of American Pictures' Foundation for Humanitarian Aid to Africa I am handing a check over to a representative for the Danish Development organization IBIS to support the construction of Kwanzu Zul. 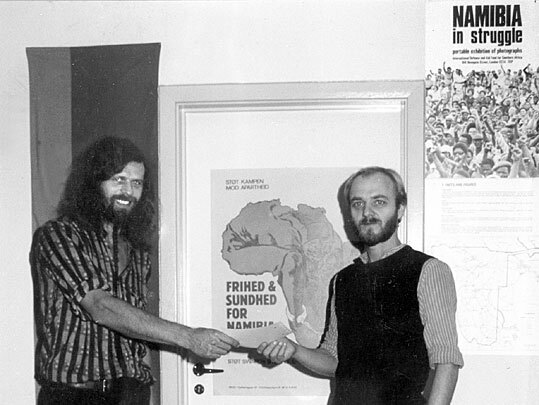 It was the home base for Namibia's guerrilla group SWAPO. Since the American government under Reagan called this struggle for "terrorism" we specifically earmarked the money to a school in the camp for the training of nurses. The leader of that school, Libertine Amathila, is today Namibia's Minister of Health and Social Services.